MW Industries is headquartered in Chicago and is comprised of 21 divisions located throughout the US. The company is one of the world’s premier manufacturers of industrial springs, fasteners, machined parts and flat-stamped spring-related products that are used in the automotive and healthcare industries. Economy Spring is based in Southington, CT and is one of the divisions of MW Industries. Economy Spring has been using Laserfiche for more than 15 years taking advantage of the powerful scan and retrieve functionality to store and share all incoming documents received by letter, fax or email. Economy Spring processes around 700 requests for quotes (RFQs) each year. This process was inefficient and processing a quote took up to a week or longer at times. Employees had to wait for hours before receiving paperwork through interoffice mail or delivery. Information needed for a quote was gathered haphazardly over many days. The customer service representative (CSR) and engineers spent a significant amount of time walking to pick up, deliver and find paperwork. Economy Spring needed to reduce quote time and lower labor costs. Also, quotes generated faster had a greater likelihood of being selected as the winning bid. Thus, management directed Economy Spring’s IT department to design and implement a solution that would automate the RFQ process and provide flexibility for streamlining additional business processes down the line. Thus two years ago, after working with the VAR, Economy Spring expanded its use of Laserfiche to include Forms because it has both the power and flexibility to meet its current needs and address future projects. Automating the RFQ process with Laserfiche Forms reduced the quote processing time to just one to two days. Economy Spring plans to reduce that time to under 24 hours with future enhancements to the process. Before Laserfiche, a CSR entered all RFQs received via email into the Infor VISUAL manufacturing ERP system. The email and attached drawings were printed and delivered by interoffice mail to the engineering department for quoting. Each engineer would arbitrarily take one of the packets to quote. Often, the engineer needed information from one or more floor departments to help prepare the quote. The engineer would walk the packet to the floor department who reviewed it and added the required information before walking it back to him. The engineer would repeat this process until all information was collected and compiled. Finally, the engineer would create a quote in the ERP system and place the packet back into interoffice mail for delivery to the CSR. The CSR then notified the customer of the new quote via email and filed the packet into a filing cabinet. Laserfiche Forms transformed this manual, paper heavy process into a fully automated, paperless process. 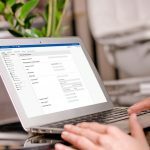 95% of RFQs still arrive via email. The CSR enters the RFQ into the ERP system and generates a quote number. He enters that quote number into a Laserfiche form which auto populates the customer information and part numbers to be quoted from the ERP system. The CSR drags any supplemental documents such as email correspondence or drawings into the form before submitting it. The quote package is saved in the repository in a dynamically generated folder structure. An email notification is automatically sent to the team of engineers about a new RFQ awaiting their review. 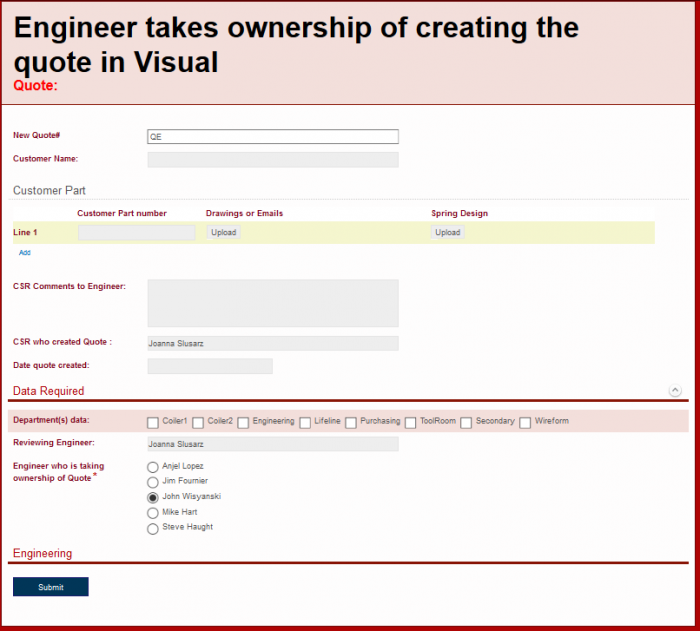 One of the engineers takes ownership of the quote by selecting his name in the form. If he has all the information needed to provide the quote, he can do so immediately. Otherwise, he selects one or more floor departments (up to eight) that can provide more information to help with the quote. 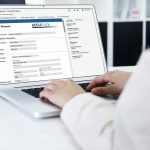 Depending on his selection, Laserfiche Forms dynamically displays the required form data, providing each worker with just the information that he needs to fill out. 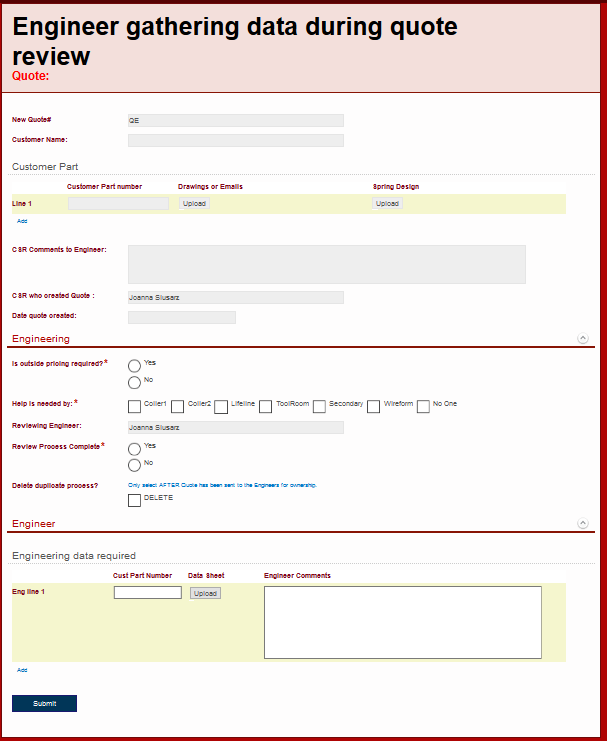 Laserfiche Forms issues a simultaneous request to all of the specified departments to provide the requested information. Sometimes, a service cannot be performed in-house and must be performed by an off-site vendor. If that is the case, the engineer selects which department will contact the outside vendor to get pricing – either Engineering or Purchasing. The floor departments review the engineer’s request in Laserfiche Forms and add all of the requested information. 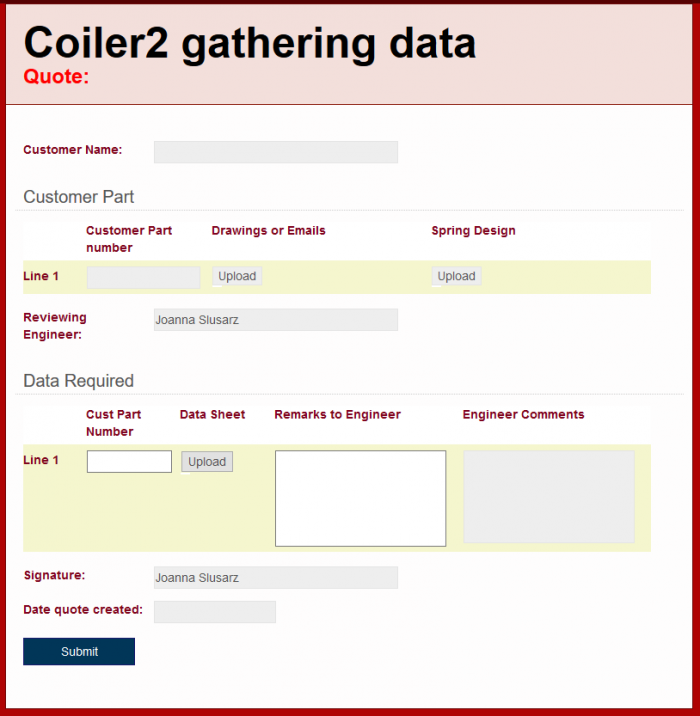 The forms are then routed back to the engineer, who can either ask for more information and send back the form, decide that this part is a no quote, or provide a quote. The engineer and floor departments can go back and forth as many times as needed, with all comments tracked in the form. 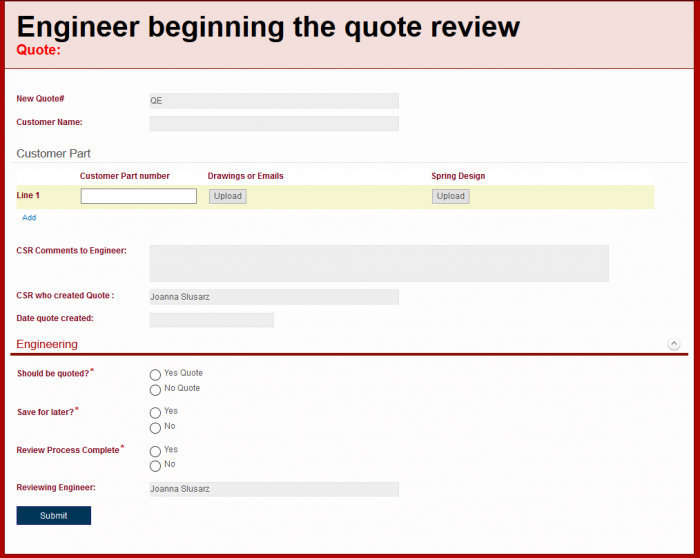 Once the engineer has all the information needed to provide the quote, he creates it in the ERP system and signifies completion by filing out the “quote created date” field in another form. 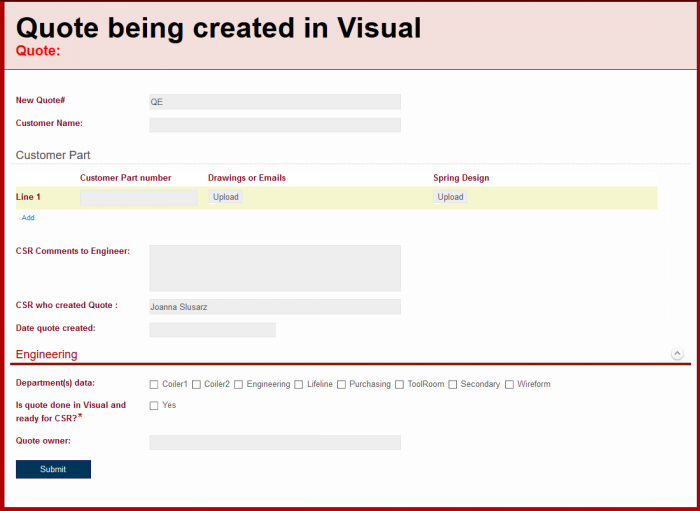 Once a quote is created, the CSR is notified instantly by email. If a quote is over a certain dollar value, it is first reviewed by management. Otherwise, it goes directly to the CSR. The CSR reviews the quote and notifies the customer. At any time during the process, the engineer can decide that the part is a no quote, which means that it is not something that the organization can manufacture. If that is the case, the CSR is notified by email and can in turn, notify the customer. The win rate for every RFQ has increased from five to six percent to 13-15% since the company that quotes first has a larger chance of winning the bid. 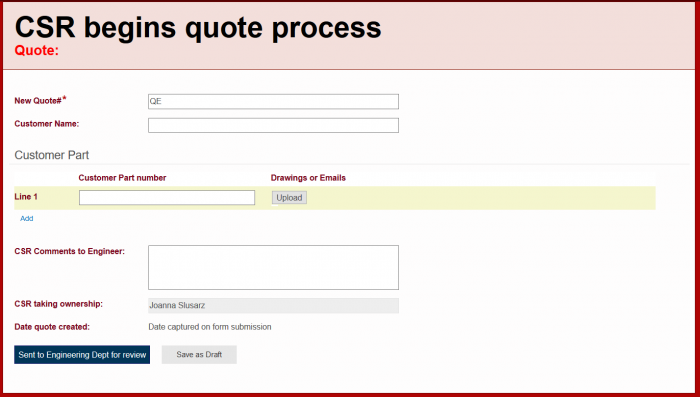 The time to generate a quote has decreased from over one week down to one to two days. All information pertaining to a quote can be viewed by anyone at any time. No time is lost searching or walking to find and gather information. Since this project, Economy has partnered with OneSource Document Solutions to implement additional business process improvements by using Laserfiche Quick Fields, Workflow and Connector that have resulted in tens of thousands of dollars in savings. Laserfiche use at Economy Spring has increased and the software is now used by most of the 180 employees. As a result of this successful initiative at their Economy Spring division, MW industries has been starting to deploy Laserfiche throughout its 20 other divisions nationwide.